NO PURCHASE NECESSARY TO ENTER OR WIN. A PURCHASE DOES NOT IMPROVE YOUR CHANCES OF WINNING. Sweepstakes may only be entered in or from the 50 United States and the District of Columbia and entries originating from any other jurisdiction are not eligible for entry. This Sweepstakes is governed exclusively by the laws of the United States. You are not authorized to participate in the Sweepstakes if you are not located within the 50 United States or the District of Columbia. 1. How to Enter. 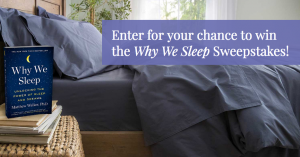 To enter the Why We Sleep (“Sweepstakes”), log onto http://simonandschusterpublishing.com/why-we-sleep-sweeps and follow the directions to enter between 12:00 AM ET on March 7, 2019 and 11:59 PM ET on March 31, 2019. You must include on the online entry form your full name and email address. All entrants must have a valid email address. 2. Start/End Dates. Sweepstakes begins at 12:00 AM ET on March 7, 2019 and ends at 11:59 PM ET on March 31, 2019. 3. Eligibility. Participation open only to legal residents of the fifty United States or the District of Columbia who are at least 18 years old as of date of entry. Void outside of the 50 United States and the District of Columbia, and where prohibited, taxed or restricted by law. Employees, officers and directors of Simon & Schuster (“Sponsor”) and its parent companies, subsidiaries, affiliates, partners, advertising and promotion agencies, manufacturers or distributors of sweepstakes materials and their immediate families (parents, children, siblings, spouse) or members of the same household (whether related or not) of such employees/officers/directors are not eligible to enter. Sweepstakes may only be entered in or from the 50 United States and the District of Columbia, and entries originating from any other jurisdiction are not eligible for entry. You are not authorized to participate in the Sweepstakes if you are not located within the 50 United States or the District of Columbia. All federal, state and local laws and regulations apply. 4. Random Drawing/Odds. Winner(s) will be selected in a random drawing from all eligible entries received on or about April 1, 2019. Odds of winning depend on the number of eligible entries received for the drawing. By entering the Sweepstakes, entrants fully and unconditionally agree to be bound by these rules and the decisions of the judges, which will be final and binding in all matters relating to the Sweepstakes. 5. Prize(s). One (1) Grand Prize winner will receive: one (1) trade paperback copy of Why We Sleep [approximate retail value “ARV” $17.00], one (1) Tuft & Needle Mint mattress, winner’s choice of size [ARV $445.00 to $995.00], one (1) Tuft & Needle pillow set, number and size to correspond to mattress size [ARV $75.00 to $200.00], one (1) Tuft & Needle percale sheet set, winner’s choice of color and size [ARV $75.00 to $125.00], one (1) Tuft & Needle percale duvet cover, winner’s choice of color and size [ARV $75.00 to $125.00], one (1) Tuft & Needle duvet insert, winner’s choice of weight and size [ARV $155.00 to $225.00], and one (1) Tuft & Needle mattress protector, winner’s choice of size [ARV $50.00 to $90.00] [Total ARV of grand prize $892.00 to $1777.00]. Total ARV of all prizes combined: $892.00 to $1777.00. Prize(s) is/are non-transferable. No substitutions or cash redemptions. In the case of unavailability of [any] prize, Sponsor reserves the right to substitute a prize of equal or greater value. UNCLAIMED PRIZES WILL NOT BE AWARDED. All unspecified expenses are the responsibility of winner(s). 6. Notification. Winner(s) will be notified by EMAIL on or about April 1, 2019 and will be required to sign and return, where legal, an Affidavit of Eligibility and Liability/Publicity Release within five (5) days of prize notification. [If [any] winner is considered a minor in his/her jurisdiction of residence, Liability/Publicity Release must be signed by his/her parent or legal guardian and such prize will be delivered to minor’s parent/legal guardian and awarded in the name of parent/legal guardian.] If [any] winner cannot be contacted within five (5) calendar days of first notification attempt, if [any] prize or prize notification is returned as undeliverable, if [any] winner rejects his/her prize or in the event of noncompliance with these Sweepstakes rules and requirements, such prize will be forfeited and an alternate winner will be selected from all remaining eligible entries. Upon prize forfeiture, no compensation will be given. Limit one prize per person or household. 9. Limitation of Liability; Disclaimer of Warranties. IN NO EVENT WILL THE RELEASED ENTITIES BE RESPONSIBLE OR LIABLE FOR ANY DAMAGES OR LOSSES OF ANY KIND, INCLUDING DIRECT, INDIRECT, INCIDENTAL, CONSEQUENTIAL OR PUNITIVE DAMAGES ARISING OUT OF YOUR ACCESS TO AND USE OF THE WEBSITE AND/OR THE SWEEPSTAKES, DOWNLOADING FROM AND/OR PRINTING MATERIAL DOWNLOADED FROM ANY WEBSITES ASSOCIATES WITH THE SWEEPSTAKES. WITHOUT LIMITING THE FOREGOING, THIS SWEEPSTAKES AND ALL PRIZES ARE PROVIDED “AS IS” WITHOUT WARRANTY OF ANY KIND, EITHER EXPRESS OR IMPLIED, INCLUDING BUT NOT LIMITED TO, THE IMPLIED WARRANTIES OF MERCHANTABILITY, FITNESS FOR A PARTICULAR PURPOSE OR NON-INFRINGEMENT. SOME JURISDICTIONS MAY NOT ALLOW THE LIMITATIONS OR EXCLUSION OF LIABILITY FOR INCIDENTAL OR CONSEQUENTIAL DAMAGES OR EXCLUSION OF IMPLIED WARRANTIES SO SOME OF THE ABOVE LIMITATIONS OR EXCLUSIONS MAY NOT APPLY TO YOU. CHECK YOUR LOCAL LAWS FOR ANY RESTRICTIONS OR LIMITATIONS REGARDING THESE LIMITATIONS OR EXCLUSIONS. 12. List of Winners/Winner’s Name. To obtain a list of winners/the name of the winner, send a self-addressed, stamped envelope by April 30, 2019 to: The Why We Sleep Sweepstakes, Attn: Ashley Gilliam, Scribner, 1230 Avenue of the Americas, New York, NY 10020.